As spring edges closer and the days get longer, fish in ice-covered lakes become more and more active. So, if you're looking to shake off that cabin fever and catch some of that late winter sun (and maybe a few fish) there's no better time than the present. Winter perch are eager biters. They often school up in large numbers and bite a wide variety of baits. Cole with a beauty of a winter Largemouth. There are two types of auger out there, gas-powered and manual. Manual augers are generally in the $75 to $150 dollar range and can drill through a foot of ice in about 30 to 60 seconds. They come in different drill sizes from 4" to a foot, which relates to the girth of the fish you'll be catching. A smaller drill will cut through the ice faster, but may create the comical situation of not being able to fit a larger fish through the hole. Gas augers drill holes much faster than manual ones, and require less physical effort, but are considerably more expensive, costing over $500. The best ice fishing rods are short, less than 3 feet long. This allows the angler to get closer to the hole and feel light bites. Longer rods are awkward and less sensitive. As far as sensitivity for ice rods goes, it's hard to beat the Berkley Cherrywood series. They're a fantastic bargain as well, as they come in a pack of two rods with line included for under $40. Plus, it's ridiculously fun to fight decent-sized fish on such a small rod, even panfish will put up a strong fight on these rods. The best way to get started ice fishing is with small jigheads and live bait. Glow-in-the-dark jigheads work great as they stand out better down in the dark water under the ice than their non-glowing counterparts. As far as bait goes, Berkley Gulp! angle worms work great for panfish, and the Gulp! 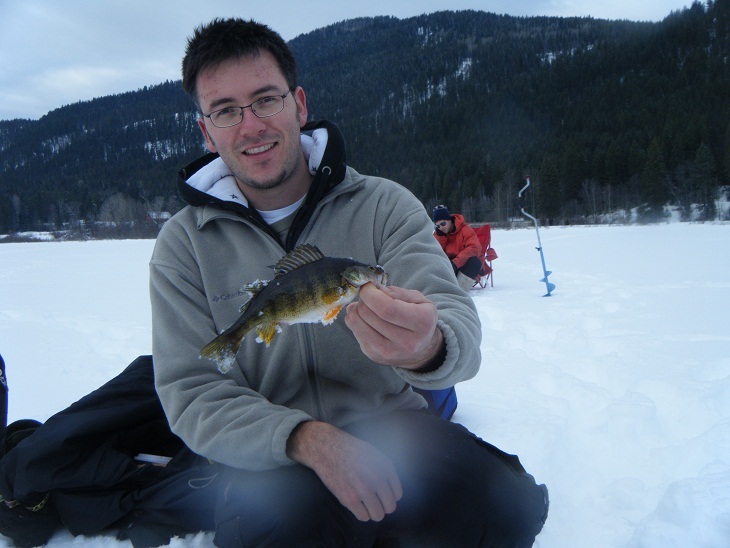 minnow and leech combo is a great all-round bait for ice fishing. But if convenience is of the essence, plain old earthworms, maggots and mealworms work great. Check local tackle shops to see what the local preferences are, as you can't beat local knowledge. 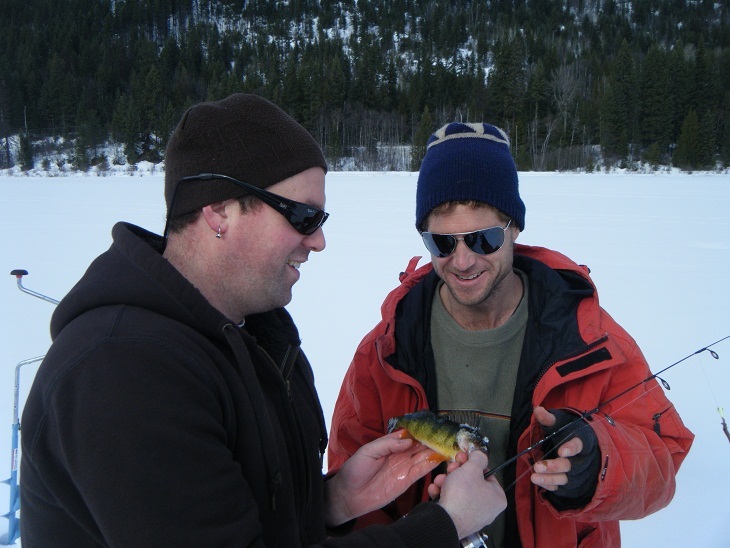 Ice fishing is a great way to spend time with buddies in the winter and a great way to introduce someone to this great sport. Six inches is considered safe-ice on the water, but as little as three inches will easily support a person, and I've fished all day on as little as four. However, ice quality can vary, and springs and aerators in certain areas of lakes can affect ice depth. 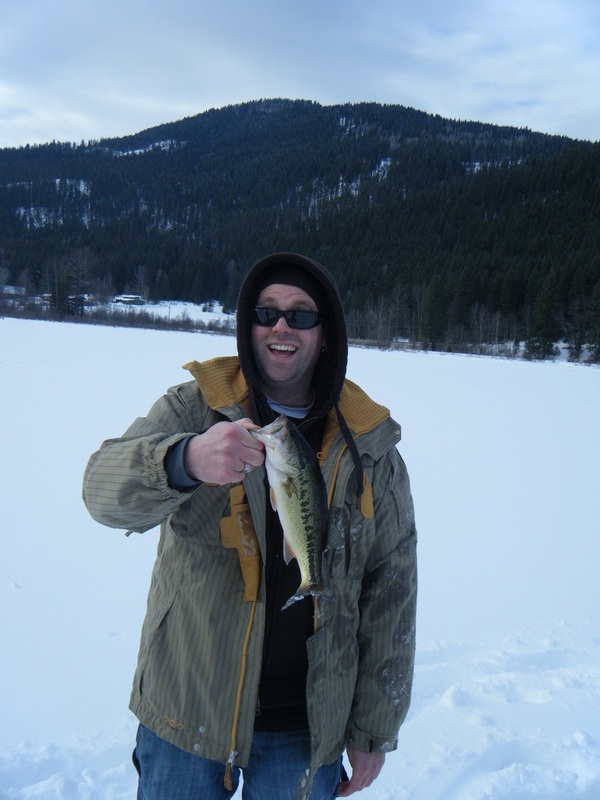 For safety's sake, stick to lakes that are known as popular ice-fishing lakes and don't go ice fishing alone. From my experience I've noticed that people new to ice fishing are generally overly cautious around ice, which isn't a bad thing at all. However, in 20 years of ice fishing, I've never been in a situation where I've felt unsafe on the ice. Just check for signs that a lake has been ice-fished recently (and if possible, check ice status at local tackle shops) and you'll have nothing to fear.